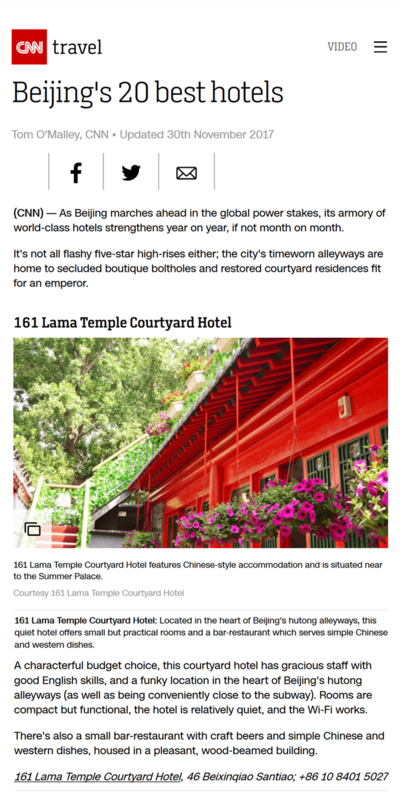 It's a great honor that 161 Lama Temple Courtyard Hotel was selected as one of the best 20 hotels in Beijing by CNN. The location of the hotel is great cause location was one of the most important things we’ve think about when we first planned and prepared for the hotel back in the late of 2013.It located in a traditional and energetic hutong,north by the famous Ghost Street,near Confucius Temple,Wudaoying Hutong and 2 subway lines. The Hutong Lama Temple Courtyard Hotel located in was also known as little Ghost Street cause it used to have full of 108 authentic restaurants inside the alley. It was the traditional old part of Beijing neighborhood during the daytime and turn to busy by night fall.The restaurants used to put tables and chairs out in the hutong it also reflected the spirit of people in Beijing how much they love a lively neighbourhood. It used to only has 8 rooms but after redesigning and remodeling,it now has a traditional Chinese style,main tone is Chinese red.When you push the entrance door open,you’ll see the western styled lobby and café where you can talk to travelers from all over the world or just simply relax by reading and listening the various choices of books and music we have here. There’s also a terrace in the yard so you can enjoy the scenery of the hutong which are the heart of Beijing when the weather’s nice. All we've been doing the whole time is to let foreign guests experience the life of Beijing as much as possible so we think let guests live among the locals is the best way to do it and either from architectural style or locations are all inlaid in the heart of Beijing-the hutongs.And about our team,they always maintained a high level of service.And we also maintained a high score on all websites and received lots of good comments and feedbacks on TripAdvisor from our guests.The secret of that is the whole team keep the spirit of genuine from the deep of their hearts to help the guests in any way they can within their power and that’s the hotel manager Dana Yang’s philosophy since it first opened back in January 2014. And now we have a rating of 9.0 on Booking.com and out of over 6000 hotels in Beijing we made it to top 60 on TripAdvisor and we also keep the rating of good reviews over 95 percent on social medias.All the guests were really pleased with their accommodations and overall staying experiences here.But of course that is not one man’s work that’s the result of our team efforts.Thanks to Dana,Jane,Simone,Mandy,Karla,Finn,Eve,Lai,Qin,Qiao,you made this happen. But of course it wasn’t so smooth sailing all the time,the facilities of the hutong house can’t compare with five star hotels so our staff await orders 24 hours every day to ensure the needs of guests cause good service requires team efforts.More than 90 percent of our guests are foreign so that requires staffs’ language skills to communicate with them and our staff would explain to every check-in guest thoroughly about the information of Beijing’s traffic,entertainment and etc because they’re not familiar with the country and the city and we want to save their time and reduce their trouble as much as we can and give them a good impression of Beijing. We often host events like cooking class.Even though we speak different languages but heartwarming events and nice little chats will bring us closer and make friends for life and most importantly make the hotel more than just a place to sleep in. This time we were selected as one of Beijing’s best 20 hotels by CNN,we shared the news and joy with all the staff when first found out about it.It was a great honor and also fame follows merit,our team well deserved it and it’s also the best reward for our long term hard working.Thanks to all the staff for their continued effort that made this happen.And we also hope that we can contribute the growth of the bright future of Beijing courtyard hotels through our strengths and attract more travelers from all over the world here to experience its culture. Click http://h3.161hotel.com/ to book now!